This is an informational website, created to help novice Digimon Masters Online players accomplish their goals in the game. here you will find information about which digimon you can befriend, and how you can get those digimon. You will also find a guide for leveling, suggesting which digimon you should fight, and when; with a few, separate, tips to follow to go with it. You will learn the basics of controlling the game, and even how you can change these controls, and make it better fit your likeness of your own keyboard. 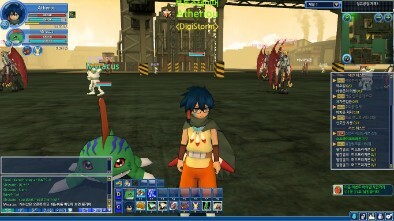 Now, you are likely wondering at this point, if you have never played Digimon Master online, what is it? What do you do in the game? Is it really that fun? To answer your questions, Digimon Masters Online, or DMO, is an MMORPG, or Massive Multiplayer Online Role-Playing Game, in which you Start off with a character of you own, and a digimon, or Digital Monster, beside you at all time as your own companion to fight with you to help the digital world with it's needs, and embark on an extraordinary adventure. You begin with a character of choice, one of four from the TV series "Digimon Data Squad", a boy lost into the digital world at only a few weeks old, a genius who graduated the top of his college class at the age of thirteen, a reckless teenager, courageous enough to take on any battle, or a responsible, mannered young woman, who is often heard mumbling to herself 'This is the worst!' when one of her fellow male Data Squad peers make a mess of things. Sadly, there is only one female character, but there is no shame in choosing any of the characters, since none of them have any faults or benefits. You then are able to name your character, a name that cannot already exist for any other character in that server yet, and move on to picking a digimon. 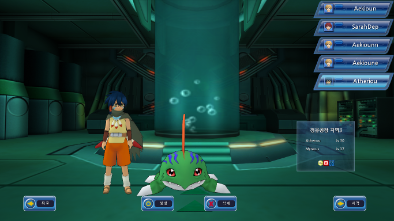 You are now able to pick one of four digimon, Agumon,Gaomon, Lalamon, or Falcomon. 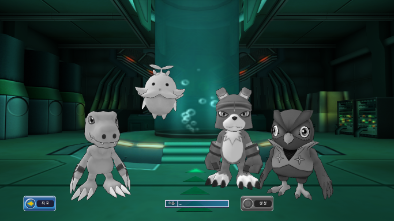 Though these digimon are set to a specific character in the series, in DMO, they are not. So you could have Marcus, the reckless teenager, and Lalamon, the digimon of Yoshino, the only female character. 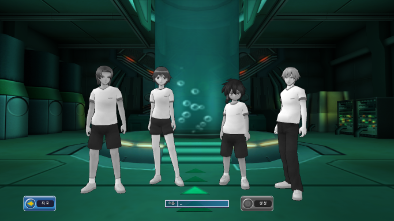 Here are their descriptions, and a picture of each in order, to the left, soloing the digimon themselves. Agumon: A spontaneous, willed, go-getter digimon, who will fight to the death for, and with his tamer. Agumon is a small dragon digimon, who spits fire balls, and has a pair of strange red straps wrapping his claw-like hands. he is a mostly yellow digimon, with a tint of orange, and has nice green eyes. Agumon may seem like an immature digimon, who will someday see this harshly soon in the future, but as he grows with you, you will begin to see how his immature courage was in vein, but was only their to balance his outstanding power. Gaomon: A calm and collected digimon who knows what to do, how to do it, and follows orders given by his tamer. Gaomon is a small dog digimon, who stands on his hind paws like a human, and has red gloves for fighting. His fur is blue, and has white around his mouth, stomach, and paws. His orange eyes show his determination, as he strikes his enemy with thousands of powerful punches. Don't be misled by Gaomon's maturity, he is not a fool, fore he knows that with patience come power. Lalamon: A peppy, do-good digimon, who's high voice diminishes the true power inside her. Lalamon is a small flower digimon, who hovers in the air, and sometime spins in joyous laughter. She is yellow-green, with a bright pink head, like a flower's bud. Atop her head lies a twisting stem, that resembles the pollen-holding stems found inside most real flowers. Lalamon's eyes are black beads, and her mouth is a tiny red 'D' on it's side. Do not judge this bundle of greatness by it's first appearance; it's beauty shines as it grows. Falcomon: A speedy, get-to-it digimon, always ready to win a brawl, becoming the ultimate victor. 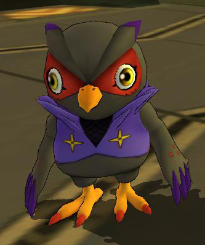 Falcomon is a small, black owl digimon, with purple tips to his eyebrows and claws. His wings are not yet formed, and they are currently used as arms. He wears a purple vest, which holds his throwing stars for his ninja techniques. His face bears a red mask-like marking across his eyes, like a raccoon. 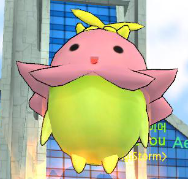 Falcomon is a digimon who's spirit will never be broken, and will always stand by your side. Though it may seem his ways of fighting cannot develop further, you will be surpirsed by his impressive skill, as he grows. After you have chosen your character, and your digimon, you may then enter the digital world, and embark on your journey; don't get discouraged! As the digimon themselves have and will come to learn: courage is there to balance power, with great courage, come great power; patience is there to discipline, with patience comes greatness; though small at first, and petite in voice, ones inner voice and heart shall lead the way to beauty; and ones ways can always be filled with improvements, and as one grows, their skill with grow with them. There is something in this world that is meant for you! You are here for a reason. Find this destiny of yours, and fulfill it!